Audi will be running three R15 TDI cars in this year's 78th running of the 24 Hours of Le Mans in June. Driving the #7 car will be Capello, Kristensen and McNish. Followed by Fässler, Lotterer and Treluyer in the #8. Rounding out the 2010 team will be Bernhard, Dumas, and Rockenfeller driving the #9. Full press release after jump. INGOLSTADT, Germany, Feb 4, 2010 - Audi will start the 78th edition of the legendary 24 Hours of Le Mans on June 12/13 with a total of three diesel-powered racing sports cars. At a press conference of the organizer, the Automobile Club de l’Ouest (ACO), in Le Mans (France), Head of Audi Motorsport Dr. Wolfgang Ullrich announced Audi’s driver line-up for the most important sports car race of the year. The Audi squad will be spearheaded by the Italian Dindo Capello, Le Mans record winner Tom Kristensen (Denmark) and the Scot Allan McNish, who in total, have scored twelve Le Mans victories. In 2008, they jointly clinched the eighth Le Mans triumph for Audi. With eight wins under his belt, Tom Kristensen (42) is the most successful Le Mans driver of all time and has just been voted "sports car driver of the decade" by the British racing magazine "Autosport." Allan McNish (40) was the runner-up in this voting. With a track record of 29 overall wins, Dindo Capello (45) leads the roll of honor in the American Le Mans Series by a wide margin. The second Audi R15 TDI will be shared by Timo Bernhard (Germany), Romain Dumas (France) and Mike Rockenfeller (Germany). The two Porsche "factory" drivers Timo Bernhard (28) and Romain Dumas (32) made a strong showing in their first race for Audi at Le Mans last year. Audi "factory" driver Mike Rockenfeller (26) won the Le Mans Series in 2008 in the Audi R10 TDI and successfully began his 2010 season with an overall victory at the 24-hour race at Daytona (USA) at the end of January. New signings Marcel Fässler (Switzerland), André Lotterer (Belgium) and Benoît Treluyer (France) have been selected to drive the third R15 TDI. Marcel Fässler (33) and Benoît Treluyer (33) have contested the 24-hour race at Le Mans several times before. André Lotterer (28) performed admirably last year on his Le Mans debut at the wheel of a privately fielded R10 TDI. All three Audi R15 TDI cars are entered by Audi Sport Team Joest and designated as cars number 7, 8 and 9. The third sports-prototype will officially run as "Audi Sport North America," the name under which it was nominated. "We are pleased that the ACO has accepted our three nominations for the world’s most important sports car race and that we will again be able to compete with three cars," says Head of Audi Motorsport Dr. Wolfgang Ullrich. "Our stated goal is to bring back the Le Mans trophy to Ingolstadt and Neckarsulm. Three cars mean three chances – and we feel that all three R15 TDI cockpits have been filled with top-class drivers. I would also like to take this opportunity to thank our colleagues from Porsche for again making two of their best drivers – Timo (Bernhard) and Romain (Dumas), with whom we were very pleased at their first Le Mans race for Audi – available to us." Audi has been competing in the 24-hour race at Le Mans since 1999 and, having started just eleven of the events, has won the French endurance classic as many as eight times. By clinching its ninth win, the brand with the four rings would equal Ferrari’s ranking in the race’s roll of honor. Only Porsche has scored more victories in its long Le Mans history. Audi has deliberately opted for a long-term commitment at Le Mans. In addition to speed, reliability and efficiency are the key factors of success in this race. Furthermore, the LMP1 class is unrivaled by any other motorsport category in terms of offering the opportunity to field production-derived technologies and to test them in racing conditions. Audi’s victorious campaign at Le Mans has been closely tied to technological innovations from the outset. In 1999, Audi clinched a podium result at its first Le Mans race thanks to reliable technology. In 2000, the pioneering Audi R8, which dominated the sports car scene for more than six years and celebrated a total of five Le Mans victories, made its debut. From 2001 onward, a TFSI engine was used. Audi then successfully introduced the combination of gasoline direct injection and turbo-charging into production vehicles as well. Today, this technology has become an integral element of Audi AG’s model range. 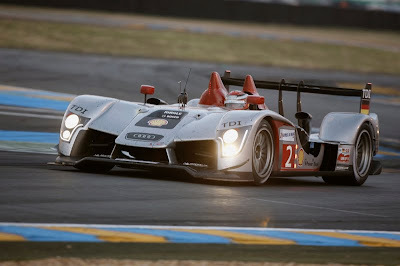 In 2006, Audi made worldwide headlines by clinching the first victory of a diesel-powered racing sports car in the 80 plus year history of the Le Mans race. As with the Audi R8, Audi Sport Team Joest scored three successive Le Mans wins with the revolutionary Audi R10 TDI. This makes Audi the only automobile manufacturer in the world to "own" as many as two Le Mans trophies. Only a team that manages a hat-trick at Le Mans may keep the silverware. In 2010, Audi again banks on TDI technology which continues to be considered the world’s most efficient technology for the French endurance classic. The Audi R15 TDI that was fielded for the first time last year, has been subjected to further development in numerous details and internally bears the project name "R15 plus." It is the first second-generation diesel racing sports car to be powered by an Audi V10 TDI engine with a power output of over 440 kW and features numerous technological innovations such as a lithium ion battery and a higher-voltage onboard power supply system. The roll-out of the "R15 plus" is scheduled for the end of February. In March, an extensive testing program is on Audi Sport Team Joest’s agenda, and the first racing commitment on April 11, at the 8-hour race at Le Castellet (France). As a dress rehearsal for the 24 Hours of Le Mans, Audi will contest the 1000-kilometer race at Spa-Francorchamps (Belgium) on May 9 with three cars. After the 2010 24 Hours of Le Mans on June 12/13, Audi plans to participate in the newly incepted Le Mans Intercontinental Cup featuring races in Great Britain, the United States and Asia with two R15 TDI cars. The Cup will precede a worldwide racing series for Le Mans sports cars to be staged from the 2011 season onward.